I know. My Canadian friends are thinking, “What the heck is he writing about Track and Field (T&F) in November for?” Hey – it’s never to early to start planning your T&F or activity day for the Spring! As well, my friend Mel (@mjhamada) and I recently had a wee Twitter flurry focused on alternate track and field events/days. After our short exchange of ideas, we decided to collaborate on this blog post to highlight our perspectives and thoughts. Take a read, tell us what you think and, most importantly, please contribute to the google doc we have started to share your ideas as well (link at the end of the article)! Mel’s Ramblings! Recently I have heard a lot of comments online about how PE was very difficult and how rotten we are as a profession! I have to say that in my High School life I adored running and so Track and Field was a joy to me as I could actually do well in something I really enjoyed. Now, I know that PE and T&F aren’t everyone’s passion but I take from this that it is also important to respect that a T&F day should also be about allowing our athletic students a place to compete and see success. “What did you say Ms Hamada?”, I hear you shout! However, I also believe that we need to not exclude students who find T&F day (as well as other traditional sports days) a grind and who are ‘sick’ on these days to avoid having to participate. It is the participation and the fun that we want to ingrain in our students. I love T&F days because they were fun for me! I will add here that I work in International schools and I haven’t had a school that has a zone or district carnival or T&F team, we just have our school carnival/day and no more. This makes me think harder about the fun and participation of our students. Long Jump – set up your students to jump across the pit on the side rather than the long end. Set up stations, have 4-7 lines all jumping at the same time into the pit and then running around back to the line. You get to see your students frequently and they get to jump a lot! Set up tiered stations next – regular jump at one end of the pit and then add a cone 1.5m back from the sand; then add a small hurdle to promote the height of a jump (over length) then add the next line with a hurdle 1.5m back etc. Students can then quickly get to their level and work at it and in a 60 min lesson you can have students jumping every 1 minute. Set up student coaches to assist with visual feedback or use your fave app to assist you. High Jump – use hurdles frequently in your HJ lessons to practice scissor jumps. Set up hurdle stations and have students practice scissor jumps while waiting for the HJ bed. Differentiate with mats, hurdles, HJ soft bars etc with lots of places for kids to practice and get maximum jumps. Running – complete running drills for sprints with student pairs watching specific technique (eg. arm swing) so they can learn about correct technique and coach each other efficiently. 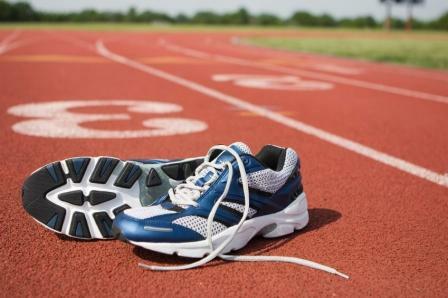 Set up mini relays or games for students that involve timing and sprinting for success, but limit competition. Avoid too many block exercises or peers that can ‘watch’ or evaluate time or distance, make the emphasis fun! Okay so coupled with these athletic pursuits, we have some fun activities thrown in for students who dislike T&F traditional events and who haven’t participated at all! The T&F day schedule has been pretty full on with 4 sessions in the day and a lunch break. Each Grade level had 4 sessions to complete the field activities offered: Long Jump and Shot put; Javelin; Discus; High Jump. The Track sessions had a separate schedule that ran all day and Field event participants went to the Track when required. Our last school hosted: 100m, 200m, 400m, 1500m and 4 x 100m relays. It was a struggle to get kids into the 1500m and I wondered if we were better off with 2 x 1500m, one for girls and one for boys to avoid the long waits! I would love to see the alternative events in-between the field or during the field events. We could then have the egg and spoon or water relay races on for Middle School while High School are completing another T&F activity and vice versa. This would bring a nice blend to the day. I am excited about implementing more of this at YIS this year and hope that our fun and participation values drive the day! I am excited to hear of great alternative activities that we could do on our day to promote fun, friendly competition between Houses and generally improve this day for all concerned! Doug’s Ramblings! I started teaching PE at a school that followed a very traditional program and T&F was run as a school wide meet. When I took over as the male PE teacher there was actually a “passing of the starter gun” at the former PE teacher’s last meet (crazy eh!). I started to keep stats on the T&F day the next year and realized that many kids skipped the day and many did minimal events (format was 2T and 1 F required or 2F and 1 T) or nothing at all. Lots of sitting around, minimal activity etc. Over my five years at that school, I slowly made a few changes but was still not really happy with how the day met student’s needs (or the PE curriculum). The next year, I taught a grade nine leadership class with a group of students that had now had a traditional TF day as well as my crazy new format. I asked them (nuts, I know) what kind of day they would like. They met and discussed things, I put in my two cents and objectives (essentially to have fun, learning, LOTS of activity) and we came up with a plan. The students wanted to be able to move with their friends and choose from a variety of active living activities as well as traditional events. But the TF “events” were not to be used to determine who went to Zone meets – that would happen separately, after school. With the students taking the lead, our eventual T&F day looked like this: student’s chose from a menu of track, field and active living sessions (AL). Each student needed to get a stamp on their “passport” for a minimum numbers of events – no limit on how many you could choose. My leadership students invented and ran the active living sessions, teachers ran the TF events and students were free to roam around with their friends and complete their passports in any order they wanted. In the morning each student had to do a required 3/6 T events, 2/4 F events and 3/6 AL events. In the afternoon it was 2/4 T, 1/3 F and 2/4 AL. The day was AWESOME! Lots of choice, lots of activity and lots of fun for all involved. Very few behaviour issues due to the high level of autonomy and almost no absences that day. Most importantly, the feedback from the students was amazing. Those who wanted the athletic challenge could compete against themselves and their friends, those who wanted to take a more relaxed approach could do that all well – but all were active! YOUR TURN! Please share what you have done for T&F days (or just activity days!) at your school. These can be event descriptions, key resources, day overviews – whatever you like! Click the link to share! Great blog post. I too moved away from the more traditional field day activities and found great success. I partnered with the local fire department and borrowed one of their water trucks for the day. This allowed me to have water as well as field activities. It was a no-pressure, have fun and be active day. Students, staff and our community volunteers had a ball and looked forward to field day year after year. To keep the activities varied each class was polled to see what they would like to do, allowing me to alternate the activities keeping interest and participation high and sitting out or absenteeism low. Who said learning can’t be fun! Thanks for the comment! The water truck idea is AWESOME! So much fun. If you could take a moment and write up your day in the google doc that would be great! I’ve had a couple opportunities to teach elementary classes now and it leaves me with a lot of respect for the creating of these awesome fun and complex activities days! I don’t know how you manage to keep everyone on track! Hey Justin – it is a work in progress for sure! See what has been done before, talk to students, decide on goals and objectives for the day – then run with it. Oh yes, don’t forget to evaluate what you have done so you can re-start the whole process for the next year!